This past week Joey and Cindy took a day out of their spring break to package up some of our Port styled wine for shipment to Switzerland. We are honored to know that our wine will end up in some of the finest restaurants in Zurich and poured side by side with true Port from Portugal. This last Tuesday, the 18th was the annual trade pouring at the Pasadena convention center. The Family Winemakers of California is a trade group that helps promote a lot of the smaller "family" owned wineries in the state, as well as many of the larger family wineries. It is one of the few trade groups that I belong to because of the exposure the two annual events provide me to both trade and consumers. The consumer event is August 24th at Fort Mason, if you get the chance it is a must do. I had to work the event by my self as no one had any free to go with me. This made things very busy for me, and did not allow me the opportunity to get out and see any of the other wineries, but that was fine. I did have the opportunity to meet with a lot of clients that I haven't seen for a while or met at all. I also had the opportunity to introduce the wines to a lot of people who were unfamiliar with the varieties that I produce. The Paso Robles Tempranillo is always the hit of the show, but I did have a bottle of the "Regal de la Vinya" as a preview of coming attractions and it was well received. It will take a few weeks for the results to reveal themselves but an increased presence in Southern California should be the result. It appears that spring is here, so it is time to start growing some vegetables. I have ordered seeds to grow a Portuguese cabbage (Beira Tronchuda) which is the basis of the famous soup called Cald Verde, which is served though out the country in many different incarnations. I also procured some pepper seeds (De Padron) These are used though out Spain as a appetizer. They grow to be small peppers about 2 to 4 inches in length. All that you do with them is quickly pan fry them with some olive oil, sprinkle with salt and enjoy, their reputation is to be very mild except there will usually be a random one that will be "Fire Hot" it comes down to luck of the draw. 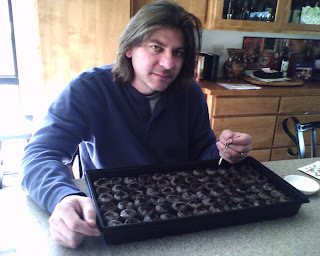 I planted a tray of cabbage and a tray of Peppers, hopefully we will have a good harvest. After tasting through the new vintage, I am pleased to report that the vintage is above average, here are a few brief notes on some of the barrel lots and how they are progressing. Verdelho barrel aged: Nice typical notes of Honeysuckle with a nice round finish. Lodi Tempranillo: Ripe berry fruit with hints of oak. Paso Tempranillo (Huerohuero): Delicate fruit aromas with a Pinot Noir elegance. Paso Tempranillo (Ohana): Deep color, dark fruit, firm tannins and complexity. Grenache/Carignane co-ferment: These are the wines that make up our "Regal de la Vinya" blend. There were two lots as an experiment, The first was fermented in 300L headless barrels and the second was tank fermented and pumped over twice a day. The barrel ferment showed delicate and complex aromas and the tank ferment was richer with a higher degree of extraction and color with more aggressive tannins. Touriga Lodi: Here it is the new descriptor, usually this wine has a very upfront aroma of curry, but this vintage all I could come up with is "Fruit Loops", if you open a box and smell, there it is. Good color and structure go along with the fruit component. Touriga Paso: There are actually two lots of Paso Touriga; young block and old block. The Young block was fermented in a 1.5 ton bin and has great color, structure and aromas, more to darker fruit that the Lodi. The Old block was fermented in barrels with the heads removed, this wine shows its strenght by being able to be exposed to 100% new oak for fermentation and still be full of fruit with only minor oak nuances. Also this is developing a nice depth and complexity that I hope will continue to evolve. Tannat Paso: A monstrous wine with a good ripeness and great extraction, the color is dark and the tannins are firm and gripping. Port Lodi: The move to foot stomping of the component wines is definitely showing in the wines. the extraction is tremendous, with great color, fruit, tannins and the right balance of sweetness. Port Paso: There is finally enough fruit available to make a Paso Robles appellation port. A blend of Tempranillo, Touriga and Souzao. It is nice to compare and contrast to the Lodi fruit. The fruit components are riper and closer to stone fruits and red fruits in the wine from Lodi, while the Paso wine is to the darker end of the spectrum, both visually and aromatically. I try and not judge vintages until a few months have passed and the wine are starting to relax in their ageing vessels. I can now say that there is some nice material out there for creating the 2007 wines. The first of March saw the first time when some schedule can be set for checking and evaluating the 2007 wines. All of the 2007 barrels were sampled and were checked for free SO2, a means of preserving the wine as it ages. There is only one 07 that has not finished its secondary fermentation, but with spring temperatures rapidly approaching, it should not be long. It is exciting to go through and taste each of the barrels and see how the oak is working with the wines. 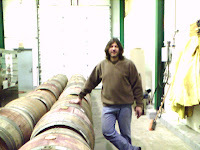 In particular I brought in barrels from a cooper that is based in Portugal. The oak is French, but the staves are dried, and the barrels are constructed and toasted in Portugal. After topping each barrel, they will be set back to age for another 4 to 6 weeks before repeating the process.